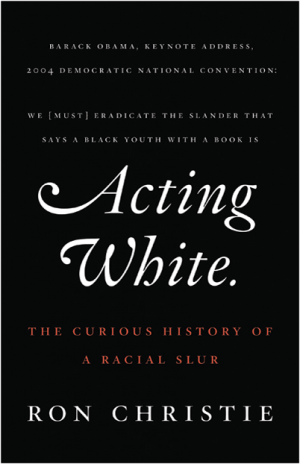 Before I begin reviewing Ron Christie’s Acting White: The Curious History of a Racial Slur I want to acknowledge my identity politics as they are crucial in my take on this book. First off I will never know what it’s like to be accused of acting white because I am white. Moreover, I am an anti-racist feminist who believes that institutional racism and structural inequalities exist and are held in place by those in power. Christie traces the implications of the slur of acting white back to Harriet Beecher Stowe’s Uncle Tom’s Cabin, arguing that a link exists between black men denigrated as Uncle Toms and the notion of acting white. He examines the ideological conflicts between Booker T. Washington and W. E. B. Du Bois as well as Martin Luther King and Malcolm X, the confirmation hearings of Supreme Court Justice Clarence Thomas, and the election of Barack Obama through the lens of what it means when Black men are accused of acting white or betraying their race. It’s important to note that Christie fails to discuss how being seen as acting white affects women of color and LGBTQ people of color—for what it’s worth, two groups who are also generally absent from or marginalized within the Republican Party and platform. Overall, Christie blames Black communities for their own socioeconomic marginalization, asserting that Blacks underperform academically because they are afraid to be viewed as acting white—never mind issues of a lack of resources for teachers and/or underfunding within the public school system. In Christie’s opinion, if this racial slur could be dismantled then young working-class Black men and women would feel free to excel in school and would be able to pull themselves up out of their impoverished communities. Acting White makes it sound that simple as Christie repeatedly touts the importance of education, dressing well, and speaking well. What hinders this goal, according to Christie, is a myriad of factors including Black leaders (he is particularly vocal about his dislike for Jesse Jackson) who point out institutional racism, which he argues sets up African Americans as victims with no agency or self empowerment. Christie also finds fault with legislation such as affirmative action arguing that these policies taint the achievements of African Americans whose hard work and dedication will be viewed with skepticism by racist whites. Christie even goes as far as to castigate parents who give their children “black-sounding” names, as studies have shown that employers are less likely to hire applicants who do not have white mainstream names on their applications. Rather than calling for an overhaul of the racist system that ignores discrimination, Christie asks why such parents would set their children up for failure in the first place. In the end, Acting White should be viewed more as a memoir and less as a treaty on the racial slur given that Christie’s subjectivity and politics color every word on the page—from which historical figures he discusses (why Booker T. Washington and W. E. B. Du Bois but not Ida B. Wells?) to the rugged individualism he touts as the solution.